The late Frank McDonald was a hero in the Hurricanes' Gator Bowl victory over Clemson on Jan. 01, 1952, but was virtually unknown before that game. Freshmen first became eligible for varsity play that year but Frank was left of the roster. 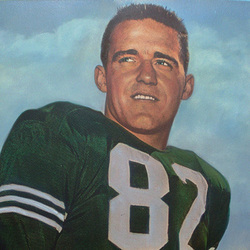 McDonald didn't start during the regular season in 1951 but was given plenty of playing time as a reserve. For the bowl game, Coach Walt Kichefski recommended to Head Coach Andy Gustafson that McDonald get the as the starting end, and he did not disappoint. Clemson was a heavy favorite for the game but with McDonald's two receptions and crushing blocks the Hurricanes upset Clemson 14-0. The Gator Bowl was the beginning of a stellar career for McDonald and before he completed his UM career he had earned four varsity letters. During his career he broke several receiving records, most passes caught and most yards gained and he is still ranked in the top 20 receivers to play at UM. In his senior season McDonald was named to the Assiciated Press All-America 1st team on a Hurricane team that finished with an 8-1 record. Frank was the first end to gain All-American status at the University of Miami.